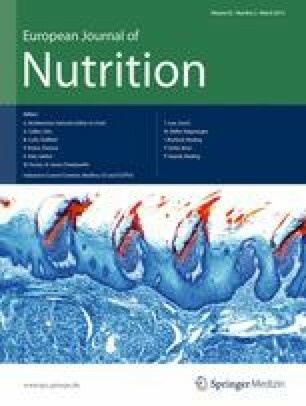 As a diet rich in fructose and an impaired intestinal barrier function have been proposed to be risk factors for the development of non-alcoholic fatty liver disease (NAFLD), the aim of the present pilot study was to determine whether a dietary intervention focusing on a reduction of fructose intake (−50 % in comparison with baseline) has a beneficial effect on liver status. A total of 15 patients with NAFLD were enrolled in the study of which 10 finished the study. Fructose and total nutrient intake were assessed using a diet history. At baseline and after 6 months liver status and markers of intestinal barrier function as well as plasminogen activator inhibitor (PAI-) 1 concentration were determined in plasma. Hepatic lipid content and transaminases in plasma as well as body mass index and some parameters of glucose metabolism (e.g., fasting plasma insulin) were significantly lower at the end of the intervention when compared to baseline. Whereas the dietary intervention had no effect on the prevalence of bacterial overgrowth, orocecal transit time and the intestinal permeability or blood ethanol levels endotoxin and PAI-1 concentration in plasma were significantly lower at the end of 6 months intervention period than at baseline. Taken together, our results indicate that a dietary intervention focusing only on one dietary parameter like fructose may help to decrease intrahepatic fat content of NAFLD patients. The online version of this article (doi: 10.1007/s00394-012-0355-z) contains supplementary material, which is available to authorized users. We would like to thank Prof. Dr. J.C. Bode, Drs. C. Schäfer and K. Dirks for their assistance with the recruitment of patients and evaluation of liver status. We also would like to thank Prof. Dr. A. Heyar for his technical support with the determination of lactulose and mannitol concentrations. Supported by a grant from the Center of Nutritional Medicine (ZEM) Hohenheim/Tübingen but the work was independent of it.